FIRST ASCENT: First ascent on September 13, 1899 by Sir Halford John Mackinder, Josef Brocherel, and Cesar Ollier. · Mount Kenya is the second highest mountain in Africa and the highest mountain in Kenya. Mount Kenya, with an elevation rise of 12,549 feet (3,825 meters, is the 32nd most prominent mountain in the world. It is also on the Second Seven Summits lists, the second highest mountains on each of the seven continents. · Mount Kenya has several summits, including its three highest peaks—17,057-foot (5,199-meter) Batian, 17,021-foot (5,188-meter) Nelion, and 16,355-foot (4,985-meter) Point Lenana. · Mount Kenya lies 90 miles (150 kilometers) northeast of Nairobi, the capital of Kenya. The mountain is south of the equator. · Mount Kenya is a stratovolcano that arose over 3 million years ago. Its last eruption was between 2.6 and 3 million years ago. The volcano rose as high as 19,700 feet (6,000 meters) before being eroded to its present height. Most of the mountain’s volcanic activity was from its central plug, although satellite craters and plugs indicate active volcanism in nearby areas. 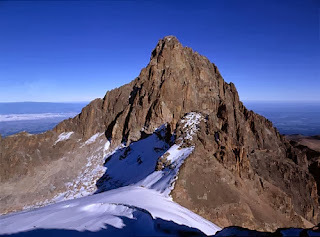 · Two extended glacial periods sculpted Mount Kenya. Moraines indicate that the lowest elevation the glaciers reached was 10,800 feet (3,300 meters). The entire summit was also covered by a thick ice cap. There are currently 11 small but shrinking glaciers on Mount Kenya. Little snow now falls on the mountain so no new ice forms on the glaciers. Climatologists predict that the glaciers will disappear by 2050 unless current temperature and precipitation changes occur. The Lewis Glacier is the largest on Mount Kenya. · Since Mount Kenya is an equatorial mountain, the day and night are each 12 hours long. Sunrise is usually about 5:30 in the morning and sunset is about 5:30 in the evening. There is only a one minute difference between the shortest day and the longest day. · The origin and meaning of the word Kenya is unknown. It is thought, however, to derive from the words Kininyaga in Kikuyu, Kirenyaa in Embu, and Kiinyaa in Kamba, all of which mean “god’s resting place.” The names of Mount Kenya’s three major peaks—Batian, Nelion, and Lenana—honor Maasai chiefs. · The first ascent of Batian, Kenya’s highest summit, was on September 13, 1899 by Sir Halford John Mackinder, Josef Brocherel, and Cesar Ollier. The trio climbed the southeast face of Nelion and bivouacked. The next day they crossed the Darwin Glacier and climbed the Diamond Glacier before climbing to the summit. Mackinder led a large expedition with six Europeans, 66 Swahilis, 96 Kikuyu, and two Maasai to the mountain. The party made three unsuccessful attempts in early September before success. · Mount Kenya is the centerpiece of Mount Kenya National Park and is listed as a UNESCO World Heritage Site for its unique geology and natural history. The mountain’s unique afro-alpine flora or plant life is considered an outstanding example of alpine evolution and ecology. Mount Kenya also has Dr. Suess-fantasy forests of giant groundsel and lobelia, as well as moors blanketed with giant heather and dense bamboo forests. Wildlife includes zebras, elephants, rhinos, antelope, hydraxes, monkeys, and lions. · Mount Kenya is much more difficult to climb than Kilimanjaro, Africa’s highest peak. To reach the twin summits of Batian and Nelion requires rock climbing skills and equipment, whereas Kili only requires stout legs and lungs. Few climbers reach the summit of Mount Kenya every year. Besides being more difficult than Kilimanjaro, an ascent of Mount Kenya is cheaper since neither porters nor guides are required. · Climbing on Mount Kenya depends on the equatorial season and the position of the sun. The ice climbs on Kenya’s southern faces are best climbed when the sun is in the north from July to September. This season also offers the best rock climbing conditions on the north and east faces. When the sun is in the south from December to March, the southern faces are best for rock climbing while the north faces offer ice climbing conditions.